Sept 15. On the PO and moving rapidly. 83 km today. Started in fog. Couldn't see much, so took it easy. Thought about the great meal I had last night and the restaurant owner who let me pitch my tent on his property. Pumpkin ravioli. The first for me. I paddled and knew there was a bridge. Couldn't see it and did not want to hit a cement structure. So waited by the edge of the river. Nice flowers. The fog lifted, and I am off. I paddle a good couple hours and then stop at a village, Castelmassa, to buy groceries. Couldn't resist a coffee and croissant. Plus a nice bathroom. I went to Coop. Hah. Why doesn't Norway have this choice of cured meats. Wow!!!! Impressed. Sept. 16. After a severe thunderstorm and torrential rainfall through the night, I was glad to see the sunrise. Zocca. A nice steeple right across the river from my campsite. Thinking a lot about direction. Where I want to go. More philosophical than geography. We all want to move forward and in the right direction. It doesn't matter about age. We all hit a crossroads in life and still want to make the right choices. Enchanted forest. Italy has a lot of them. I take a break and it looks something out of the Pirates of the Caribbean. I find another safe spot to tent. 63 km behind me. Still haven't reached Venice. Miscalculated the mileage. But am amazed at the beautiful scenery. Sept 17. Thought I would reach Venice. Wrong. Looks closer on the map. Terrible winds on the sea. I took a much longer alternative route which meant portaging, paddling through a drainage system, in and out of a river. What a day!!!! The conditions were not easy. Wind everywhere. Frustrated. Possibly could have chosen a better route, but no time to count unhatched eggs. Done is done and I am closer to Venice. This isn't a boat lock. But it was a tricky crossing. Hah. A local said it couldn't be done. So I left my kayak and walked the 44 minutes to see if it was possible. It was. So I did it!!!! Oh yeah, it smelled a bit. 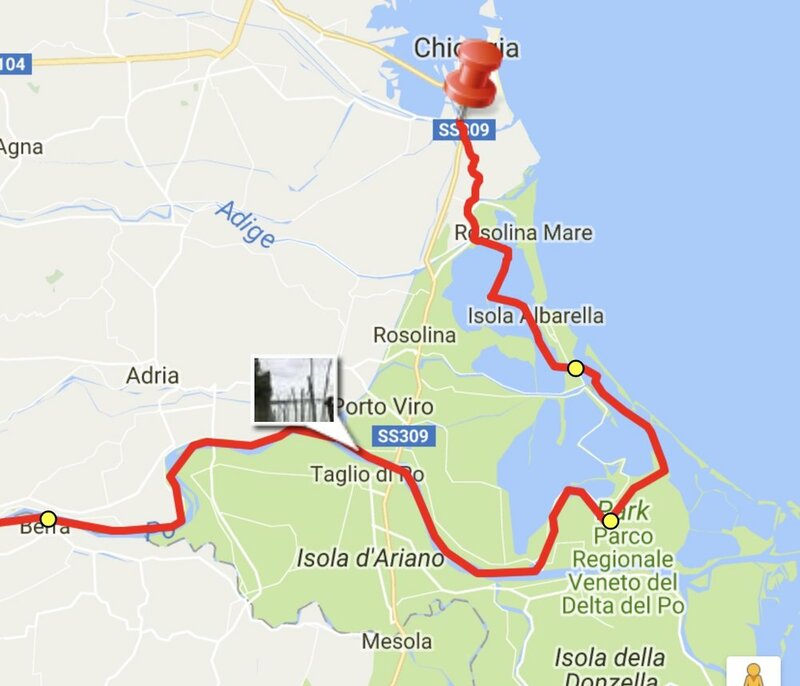 I really wanted to reach Venice, but I got as far as Chiaggio Veneta. I stopped by a pleasure boat and asked if the boat lock would let me through. They said yes and then asked me if I was hungry. I said "YES". Before you knew it, I was at a table with a whole bunch of lovely Italian people. They were so gracious and supplied all sorts of food and even Prosecco. Wow!!!! Needless to say, I am tenting in this marina. Venice will come tomorrow. These lovely people!! I felt a heart connection with them. I would have loved to talk and share thoughts about life and experiences. He gave me a flag and a donation which I will keep for the rest of my life. That is the flag and not the donation. The lady gave me all sorts of good snacks and a beer and water. Thank you AMAZING group of lovely Italians. Lots of love. Newer PostWill I Ever make it to Venice?